Northern Michigan’s ski resorts have been emailing their customer lists, rejoicing with the word “snow” in the subject line. Our first storm Up North and a long awaited week of cold has the snow guns running at Caberfae, Crystal Mountain, Shanty Creek Resort, Boyne Mountain, Boyne Highlands and Nubs Nob. So will ski resorts open for Thanksgiving? Find out below! Nub’s Nob, Harbor Springs, will have two slopes and two runs open all Thanksgiving weekend. Bigtime, a beginner slope and Smooth Sailing, an intermediate, will be open this Thursday, Friday, Saturday and Sunday from 9:00 a.m. until 4:30 pm. Lift tickets range from $10 for children under 12 and $30 for adults. Boyne Mountain will open Hemlock, Victor, and Pierson slopes and the Hemlock chairlift, Thursday through Sunday, from 9 a.m. – 4:30 p.m. Lift tickets are $30 to $39 for adults. After Sunday, the slopes close with plans to reopen for the season on Friday, December 2. Check out Boyne Mountain’s snow conditions page for the latest news. Boyne Highlands, Harbor Springs, will have the Heather lift open from 9 a.m.–4:30 p.m. Thursday through Sunday for $35 a lift ticket. Check out their current conditions for updates. 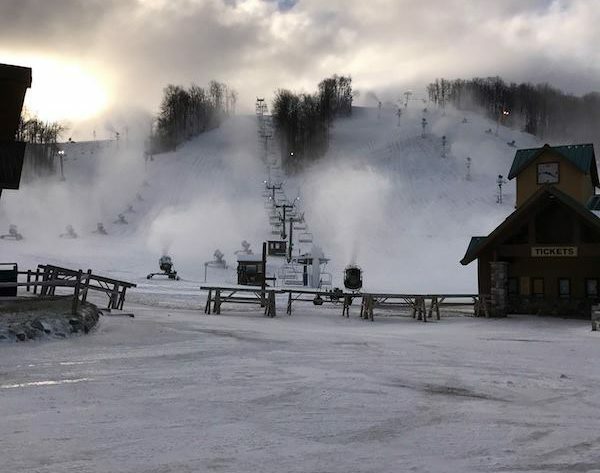 Crystal Mountain, Thompsonville, isn’t predicting it’s opening day; they are making snow and pointing folks to their Black Friday, Cyber Monday specials including a four-pack of lift tickets for just under $200. Shanty Creek Resorts is also keeping their opening day a surprise while they make snow and celebrate the arrival of winter on Saturday with a Short’s Brewski Day where the first 100 folks through the door at Short’s Brewing Company in Bellaire score a free lift ticket for later in the season at Schuss Mountain.